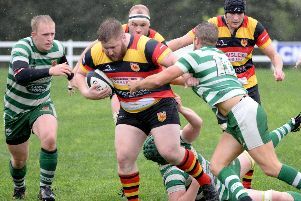 Harrogate RUFC's director of rugby Dave Doherty was left to reflect on might have been after his side suffered the narrowest of defeats at Wirral. Eighty minutes of attritional action produced just the one solitary score, a long-range penalty goal that was kicked by home full-back Jimmy Annetts early in the second half. The men from Rudding Lane gave a good account of themselves in extremely windy conditions and came close to breaking through on a number of occasions, but with a finishing touch eluding them, they ended Saturday's North Premier contest on the wrong end of a 3-0 scoreline. "It was a really strange one, you don't see many games finishing with a score like that," Doherty said. "When I think back through my whole career I can only think of one 3-0 that I was involved in when Leeds Tykes turned over Bath on an absolute swamp of a pitch at The Rec. "It's really frustrating because we ended up camped on the Wirral line numerous times, we had chances and came very close, but on too many occasions we made mistakes that let them off the hook. "I can't fault the boys' effort, there was just a little bit of over-eagerness, some ill-discipline and too many unforced errors. "It wasn't a great game because of a massive gale blowing across the pitch. Only the purist of rugby purists would have enjoyed watching it, but credit to Wirral for the way that they played the conditions and also to their full-back for kicking a goal from 40 metres out in such tough conditions." Following a scoreless opening half during which Wirral played against the wind but still dominated possession, Annetts broke the deadlock six minutes into the second period when 'Gate went offside 40 metres from their own line. Doherty's troops controlled most of the remainder of the contest, and it seemed only a matter of time until they breached a stubborn home rearguard. 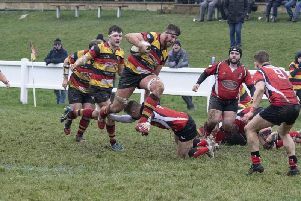 Yet, despite sustained spells of pressure and both replacement forward Andy Boyde and winger Andrew Lawson making it to within inches of the try-line, Wirral managed to hold on to their slender advantage. The result leaves Harrogate fourth in the North Premier standings ahead of Saturday's home clash with second-placed Blaydon.